A drawstring through the hood of the hoodies can pose a strangulation hazard to children. No injuries have been reported. 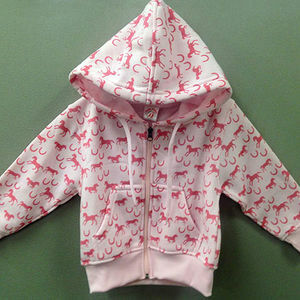 The recall includes about 2,300 Kiddie Korral girl's pink hooded sweatshirts with red ponies and a drawstring through the hood. The zippered front hoodies have two front pockets, are made of 100% polyester and were sold in sizes 2 through 12. A label sewn into the garment?s neck seam reads "Kiddie Korral" and a label sewn into the side seam has RN#117026 and style number 327. Children's boutiques, gift shops and other specialty retail stores nationwide from December 2012 through November 2014 for about $25. Kiddie Korral at (800) 445-7195 from 9 a.m. to 5 p.m. ET Monday through Friday, or online at www.kiddiekorral.com and click on the Recall tab at the top of the page.